The United States Congress designated the Tuxedni Wilderness (map) in 1970 and it now has a total of 5,566 acres. All of this wilderness is located in Alaska and is managed by the Fish and Wildlife Service. Over a century ago, two islands at the mouth of Tuxedni Bay off of Cook Inlet--Chisik and Duck--were established as a refuge for seabirds, bald eagles, and peregrine falcons. It was not until much later that they began Wilderness. Most of the Wilderness lies on Chisik Island (tiny, six-acre Duck Island is a rocky dot with almost no vegetation). 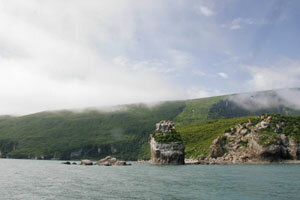 Chisik slopes upward out of Cook Inlet from sandy beaches on the southern end to 400-foot cliffs on the northern end. A cannery located on the southern end occupies a small non-Wilderness area of the island. An understory of salmonberry, alder, and other brushy growth forms an impenetrable, wet jungle over much of Chisik, filling the few openings in the spruce-hemlock forest. The higher elevations are alpine tundra from which the volcanoes of Mounts Redoubt and Iliamna in Lake Clark Wilderness often can be seen. Chisik Island has no trails. Camping is unrestricted. Hunting is not allowed, but fishing is permitted, with salmon being sought most often. Small planes and boats land here, but sudden winds and rough waters make access risky. Planning to Visit the Tuxedni Wilderness? How to follow the seven standard Leave No Trace principles differs in different parts of the country (desert vs. Rocky Mountains). Click on any of the principles listed below to learn more about how they apply in the Tuxedni Wilderness.